Stay in LIKE or Fall in LOVE! 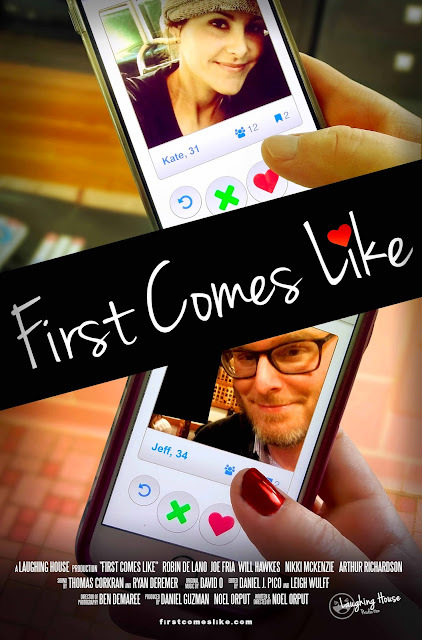 After they both swipe right, Jeff (Joe Fria) and Kate (Robin Delano) try to prove that it’s possible to build a personal relationship through the most impersonal of ways--technology. From flirty texting to their first Skype date, they find themselves drawn to each other but are reluctant to step out behind their digital curtain and meet in person. Because in today's dating scene, first comes like…and then comes…? Is Technology a step ahead of Love? Have we become the romantic castaways in constant competition with gadgets in a world of zeros and ones. Noel Orput's romantic Dramedy rewrites a pro and con list of a "Love" that is mediated through data and while it addresses the moral question of the potential of love, intimacy, experience in a world governed by technology, it doesn’t judge. Songs like “Enough” written by Dalal and sang by the Film’s protagonist Robin Delano or Debbie Gibson’s “Take me there” and Moi Navarro’s “Turn Around” will take you on their own “dreamful” musical journey.